There comes a time in a comic book’s life when you kind of… run out of stories to tell. For example, Brian Michael Bendis has been writing Ultimate Spider-Man since the title debuted in 2000, and he’s got 160 or so issues under his belt of that title alone. Surely he’s got to be a little tired of Peter Parker, right? Well, Bendis has reinvigorated the Marvel Ultimate Comics version of Spidey by, ahem, killing him and replacing him with a new kid. 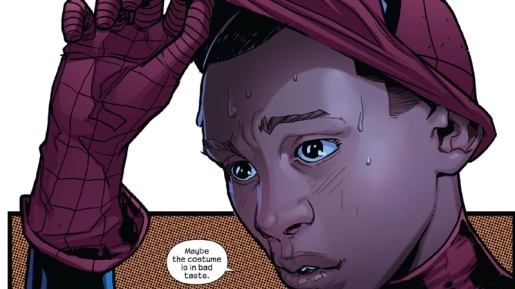 Meet Miles Morales, the half-black half-Hispanic replacement for Peter Parker and the brand-new Spider-Man. It remains to be seen if the new Spider-Man’s debut will be as popular as the original Spider-Man’s debut, but from the buzz I hear, people are excited about the prospect of a Spider-Man who isn’t a minority (or they’re just excited about a whole new direction for one of their favorite super heroes as written by one of their favorite writers working in comics). As for me, as long as Miles Morales keeps his mask on and doesn’t break into song, I’m thrilled. Morales will make his debut in Ultimate Fallout #4, and will be taking up the web-slinging mantle in Ultimate Comics: Spider-Man, which will debut in September.